When you fly over northwestern Ontario where there is almost as much water as land, having to ditch in a lake or river is a very real possibility. That’s why students in Confederation College’s Aviation Flight Management program took “dunker” training at the Lakehead University C.J. Sanders Fieldhouse. 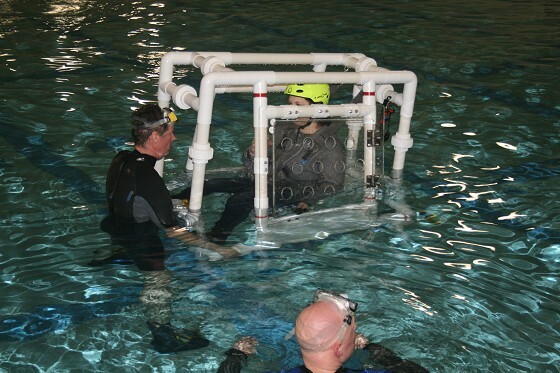 During the course, students learned Submerged Aircraft Fuselage Egress (SAFE) Training. This course taught students in a controlled setting how to safely exit an airplane that has crashed, flipped, and submerged in water. The training is similar to that shown in the “Dilbert Dunker” scene in the movie An Officer and a Gentleman. “Many pilots who crash during a water landing or ditch on a lake survive the impact, but then drown when they become disoriented in the aircraft and can’t escape,” said Paul de Oude, Chair of the School of Aviation at Confederation College. “Since every pilot flying in northwestern Ontario will be flying over water regularly, we make SAFE Training available. The course is run by Transport Canada Aviation Safety Award winner Bryan Webster, who developed his course after surviving a ditching accident himself in 1977. A renowned expert in the field, Webster has since been featured on an episode of The Aviators demonstrating water egress.